Strictly typed reference to the VI that implements the objective function(s), the equality constraints function, and the inequality constraints function as separate outputs. Initial values of the parameters at which the optimization starts. This node uses the values in start when beginning state is empty. Each row of start represents one set of parameters. If start has fewer rows than population size, this node initializes the remaining sets of parameters. If start has more rows than population size, this node ignores the additional sets of parameters. The number of columns in start must equal the length of minimum and maximum in parameter bounds. Initial values of the populations and Pareto indexes. beginning state is typically the ending state of a previous optimization and allows a warm start of the optimization. If beginning state has values, this node ignores start. Initial values of the parameters, objective functions, equality constraints, and inequality constraints. Initial values of the candidate parameters. Values of the objective functions at parameters. Values of the equality constraints at parameters. Values of the inequality constraints at parameters. Indexes of the selected parameters from all the candidate parameters. Settings for the differential evolution (DE) method. The DE method is a population-based optimization method. It makes a tradeoff between exploring the global space and converging to the most promising solutions so far. This tradeoff is affected by the variance of the mutant parameters in the population. The variance of the mutant parameters in the population decreases as the node converges to a solution. You can control this variance by adjusting the scale factor and mutation method settings. Number of sets of candidate parameters that this node calculates and number of objective function calls at each loop iteration in the optimization. The greater the value of population size, the more accurate the optimization results and the longer the execution time. Diversity factor that this node uses to generate mutant parameters. The greater the value of scale factor, the more variance in the mutant parameters. Probability that this node inherits the trial parameters from the mutant parameters. The greater the value of crossover probability, the higher the probability that this node accepts the mutant parameters. Method that this node uses to map the trial parameters into parameter bounds. This node ignores bound mapping method if the values of the trial parameters are within parameter bounds. None 0 Does not map the trial parameters into parameter bounds. Random between Bounds and Values 1 Maps the trial parameters to a random value between the parameter values and parameter bounds. Re-Initialize 2 Generates new trial parameters within the bounds. Method that this node uses to generate mutant parameters. Random 0 Generates the most variance in the mutant parameters. Either Or 1 Both generates the most variance in the mutant parameters and is invariant to rotational dependence in the parameters of the problem. This method is generally the most robust method. Best 2 Biases the mutant parameters towards the most promising solution of the current population and generates mutant parameters with the least variance. 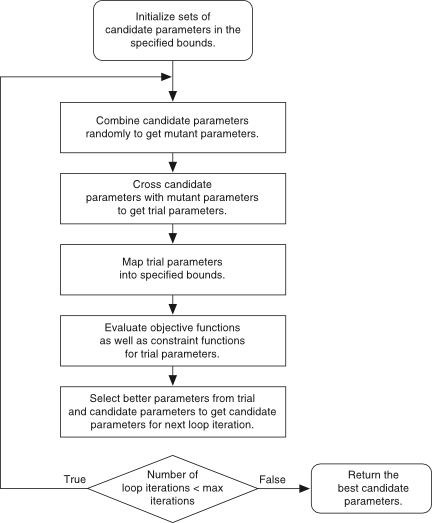 Target to Best 3 Generates mutant parameters with a level of variance between the Best method and the Random method. This node terminates the optimization if this node passes any of the maximum thresholds. Determined values of the variables where the objective functions have the global minimum among all minimum possibilities. Values of the objective functions at minimum. Final values of the populations and Pareto indexes at the end of the optimization. Values of the candidate parameters, objective functions, equality constraints, and inequality constraints at the end of the optimization. Values of the candidate parameters at the end of optimization. Function values of the equality constraints at parameters. Function values of the inequality constraints at parameters. This node determines the global minimum using the differential evolution (DE) method. The DE method approximates the actual global minimum by iteratively mutating and improving the candidate parameters from the initial set of candidate parameters. The DE method cannot guarantee finding the global minimum. Whether this node can return the best parameters depends on the DE settings and the objective functions. The following illustration shows how this node determines the global minimum.